The ultimate guide to Kitzbuhel ski holidays in 2019 & 2020. Surrounded by the beautiful Kitzbühel Alps, Kitzbuhel in the Tyrol is a romantic medieval town with heaps of Austrian character and a great snow sports experience. Internationally famed for its après ski and the presence of the legendary Streif, it’s a holiday destination for the fashionable and fearless, and features on many a skier’s bucket list. Kitzbühel’s colourful medieval architecture, cobbled streets and gothic church contribute to a traditional village feel and with a 360 panorama of the Kitzbühel Alps, it’s a real feast for the eyes. You’ll find a friendly, animated atmosphere that reaches its height in the evenings where the resort is known for offering some of the best Austrian après ski around. A place to shop, dine and drink in style, Kitzbühel is well known for its designer boutiques, award winning restaurants and cosmopolitan nightlife. 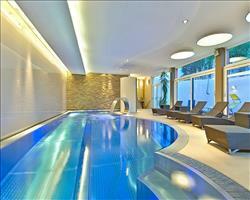 Non-skiers will find a good range of activities indoors and out, from paragliding to wellness centres. You simply can’t discuss Kitzbühel without mentioning the Hahnenkamm World Cup downhill race which is hosted there every January. It takes place on the Streif run and is said to be the most difficult in the world. Crowds of snow lovers journey to Kitzbühel to watch the race and enjoy Austrian après ski at its best - you can even give the run a go yourself later on in the season. 52 lifts carry more than 95,000 people an hour to 60 pistes in the local area covering 170km. 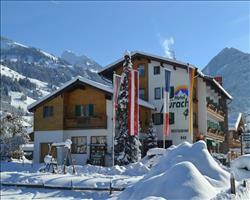 Kitz has huge variety of slopes with nursery areas, steeps, moguls, powder and freestyling terrain. If you’ve already covered the local area or the weather has compromised slope condition, you can go higher and further with the ‘Star Card’. This gives access to 24 snowparks and 1,087km of pistes overall, 824 km of which have guaranteed snow. The pass covers 10 different areas, including SkiWelt, Fieberbrunn, Sankt Johann im Pongau and Alpbach – far more than you'll manage to cover on a week’s holiday. View our detailed Kitzbuhel snow forecast or snow report and see all live webcams, piste maps, road and travel maps and lift pass prices. For a picture of historic snow conditions see the snow depths month by month with our Kitzbuhel snow history. Kitzbuhel will leave both intermediate and advanced skiers and boarders very happy and doesn’t disappoint beginners either. You can even night ski on the Gaisberg (piste 41). Holidays here are good value for beginners thanks to the free lifts on 7 of the practice runs. You’ll find some convenient nursery slopes near the Hahnenkammbahn lift, a beginner zone in Jochberg and a sunny nursery area high up on the Horn. For snowploughers, the Horn has some cruisey blue runs and lots of undemanding pistes including the long Hagstein (piste 3) and the Kaser (piste 26). 45% of the pistes are red, making the area great for intermediates. There’s a variety of intermediate terrain from wide open runs to narrow woody slopes with steeps and moguls in-between. Advanced and experts can’t leave without tackling the Hahnenkamm’s legendary Streif. Claimed by some to be the most difficult ski run on earth, it features in the world cup every January and its sharp turns, jumps, steeps and bumps make it a downhill descent like no other. Providing it’s open (the run is closed leading up to the world cup) it's one of the greats to tick off your list. The off-piste terrain here is a hidden gem that confident skiers will also love; there’s 33km of avalanche safe powder and moguls including Hochsaukaser (piste 55) and Lärchenhang (piste 2). The area has 120 km of cross country trails and offers a 35km "safari" adventure. The area is very snowboarder friendly and offers 33km of powder for safe freeriding. Freestylers will love the DC Snowpark at Hanglalm which has jumps, rails and curves for a range of abilities. The gap jump is a huge attraction, making Kitz a regular destination for pro’s while beginners can enjoy the Mini Snowpark on the Horn. Austrian après ski is arguably the best there is... and "Kitz" certainly doesn’t let the nation down. The nightlife is vibrant and varied, offering plenty of choice whether a day of schussing leaves you wanting to sip schnapps with the socialites, table-dance with merry locals or have a quiet winter-warmer with friends. The Pavillon is a popular and lively bar while you’ll find an Irish pub scene in O’Flannigans and great cocktails in Bergsinn. For after-hours partying, Club Take Five is a great nightclub. A foodie favourite, Kitzbuhel is well known for its combination of traditional restaurants, charming tearooms and gourmet establishments. You’ll find lots of lovely Austrian cuisine served on and off the mountains, tasty seafood at 1st Lobster and for pizza eat at Centro. There are lots of highly acclaimed fine dining establishments, including Neuwirt & Tennerhof (both were awarded Michelin stars in 2009). Kitzbuhel has a great range of off-slope activities including an indoor ice-rink at the Sports Centre and another outside on the fabulous Schwarzsee lake. The Gaisberg has a floodlit toboggan run for group and family fun on the snow and 170km of winter hiking trails, allowing non-skiers to enjoy the fantastic views. If you’ve had your fill of the fresh air, there’s a gym, tennis court and climbing walls and the Aquarena has swimming and spa facilities. When is the best time to ski Kitzbuhel? 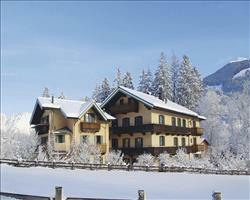 Kitzbuhel has a long season from November through to April. While the altitude is low compared to other resorts, the slopes lie on grassy mountains - so they don’t require a huge amount of snow to remain skiable. Snowmaking is improving in the area: 780 snow cannons can provide artificial snow cover if necessary. If conditions are lacking, it’s worth considering the ‘All Star’ card: the extensive loosely linked area has 4,183 snow cannons and 824 km of virtually guaranteed snow slopes. If your choice of date to visit Kitzbühel depends on the quality of après ski, book your holiday during Christmas and New Year when it’s buzzing. 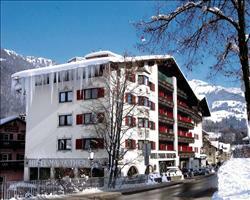 To see Kitz’ at its finest – go when the legendary Hahnenkamm race is on (usually around 25th – 27th January). 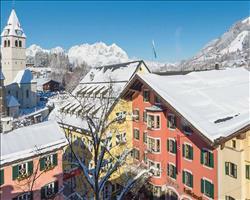 With a ski area, activities and accommodation for all ages, Kitzbühel is a great destination for family holidays. Chalet Karlberger is a large chalet sleeping up to 35 in a fantastic location – the ski school and lift are right next door and it’s ski in / ski out, making it ideal if any of your family are taking lessons. 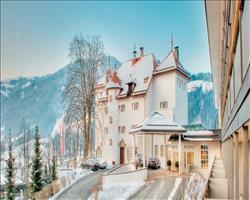 Somewhere in a quieter position is family-friendly Hotel Schloss. 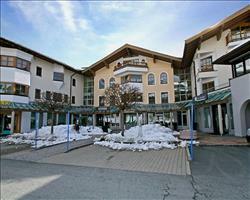 It’s 1km from the town centre but you can use an efficient bus service to get to the town and ski lifts. Ask us about accommodation with childcare services if you’re travelling with little ones who are too young for ski school or think you might fancy an adult night out. If you’re taking your children skiing for the first time, you’ll be spoilt for choice with an amazing range of ski schools. There are some brilliant learning areas with magic carpets where children can learn in a fun and safe environment as well as a good selection of gentle, cruisey runs that everyone can enjoy together. Experienced teens can book into special youth courses and discover the local powder in a group of similar ages. Head to the floodlit sledge run for a fun family evening on the snow. Booking is simple with our holiday packages – opt for accommodation, flights and transfers if you want to get to the mountains soonest or choose accommodation and channel crossings if you prefer to drive. Hotels can work brilliantly for groups - everyone can pick a room that suits them and join together in communal dining areas, bars and facilities. 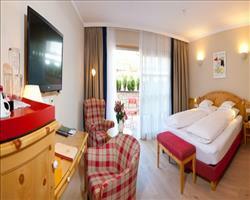 Hotel Strasshofer boasts an excellent location right in the middle of the medieval town centre, with easy access to everything in the town as well as the slopes. Offering a more authentic mountain experience in a terrific position for groups of all abilities, Chalet Karlberger is ski in / ski out and you’ll appreciate the convenience of having the ski school and lift pretty much on your doorstep. It has 15 rooms and sleeps around 30, making it brilliant whether you’re a big group wanting somewhere to yourselves or a small group happy to meet new people. The resort and ski area have something for all kinds of groups. Meet up for some legendary Austrian après after a day on the slopes – there’s terrain for all levels of skier and boarder, particularly those more experienced. Make sure to have a session of night skiing together on the Gaisberg for a unique experience on the snow. Any non-skiers tagging along won’t find themselves at a loose end thanks to a range of non-ski adventures on the snow, brilliant shops and various sports and wellness facilities. Booking for a group might seem tricky, but with our accommodation, flights and transfers packages, it’s really simple. Give us a call and let our ski specialists do the searching for you. "One of the world's best ski resorts"
Kitzbühel is one of my favourite resorts, I like the town being traditional and Austrian and the après ski is brilliant. There’s shopping if you want it and some nice restaurants, it’s good all round really! The snow in February was ok but that was probably the end of it, we’ve been skiing here in March before and it was slushy by 1pm. I would probably say that it’s best for intermediates and above, as to get to the top is quite difficult unless you’re at an intermediate level. I have spent a lot of time in the winter in Kitzbuehel and I still can not get enough of it. 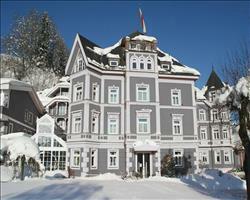 Kitzbuehel has so much to offer. There are some fabulous slopes for all abilities and enough to keep you fully occupied year after year. It’s a great town which has kept lots of tradition. A highlight is the World Cup Hahnenkamm races at the end of January. The town is completely booked out and has a buzz day and night, There are also some very good restaurants in Kitzbuehel, such as Rosi's Sonnbergstubn, Casino and the candle light dinner on the Hahnenkamm mountain. The Christmas Market is also worth a visit. 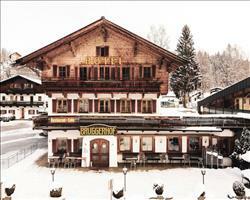 It is very Tyrolean and cute with lots of typical foods and Gluehwein. 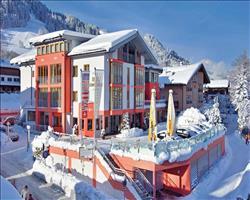 St. Johann is a 10 minute drive/train from Kitzbuehel with some lovely shops and again some great pubs for Apres Ski. Kitzbuehel is a great place, highly recommend a visit! "Kitzbuhel the week before Christmas"
We’d been to Kitzbuhel before and have always thoroughly enjoyed it – this time we had another brilliant holiday. It’s a great place, such a pretty village and everything was so Christmassy on the week before Christmas (the best week to ski!). It’s quite a low resort which was a little concern this season, but it did get the snow it needed and although the area wasn’t all open, we skied and enjoyed all the bits that were. We didn’t eat out as we had a half-board package in our hotel but we did go to a couple of bars: the Londoner and Final Destination - both of which we liked. I’ve been skiing all my life and consider myself a good skier, if you’re a good skier, Kitzbühel is good enough for a week but I wouldn’t stay any longer than this. It has a good variety of skiing with nice steep runs to challenge good skiers, the Austrian ski school are world famous if you want to learn and there is some long off-piste if you want to be adventurous. The ski area is not very high so it’s probably not great late in the season. You’d be taking a bit of a chance going much later than mid March (you’d still be able to ski but probably not all the way back down). The town itself is a truly chocolate-box pretty town and it was beautiful to be there. It’s a very traditional place, one of those places every keen skier should go to at least once. Some fall in love with it and go back again and again but I’m more of a hungry skier and have a few other places I want to explore first. "Good skiing, few queues, great mountain restaurants"
I’d highly recommend Kitzbühel. The skiing is really good, not much queuing and once you're up on the mountain you’re away. My family are all pretty good skiers and we had a great time. Kitzbühel has some great on-the-mountain restaurants where you can stop off and have something to eat and do a bit of sunbathing. The village is nice but more expensive and you end up paying a little more for everything. We didn’t go out a great deal but what we saw in terms of bars and restaurants was good. "Good skiing but not huge if you're advanced level"
The nightlife isn’t too bad, there are some good ski bars on the mountain (although the beer is expensive – it’s a lot cheaper in the supermarket). The skiing was good, I managed to get over onto the SkiWelt area as I’m quite advanced and the local area wasn’t really enough for me – if you’re an advanced skier I’d definitely recommend skiing the other resorts, I managed to do the whole area in 3 days. 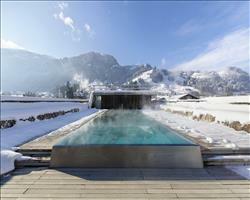 For average skiers who take it steady there’s more than enough in Kitzbühel itself. 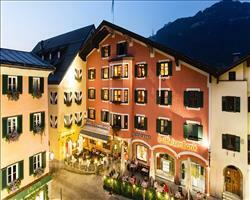 Kitzbühel is a really pretty, upmarket town with traditional Austrian medieval buildings. The shops are very posh but not as expensive as Courchevel. We walked into town for the farmers market one day which was lovely. It’s good for skiing and there’s something for all once you’re up on the top. The conditions were a little slushy on the slopes by the town because we were here at the end of March, but up on the mountain was fine. "Quiet in April, good ski facilities"
Kitzbühel was dead at the end of the season – I have definitely been to livelier resorts. But for what we saw it’s nice enough, the weather was baking (20 odd degrees) at the beginning of the week, so the first days were beautiful. Then the fog came in and you couldn’t see a metre in front of you, so we didn’t bother going out! The ski facilities here – gondola, lift pass etc – are great. The town itself is quaint and very traditional. It has some lovely antique shops and is a nice place to just wander round.